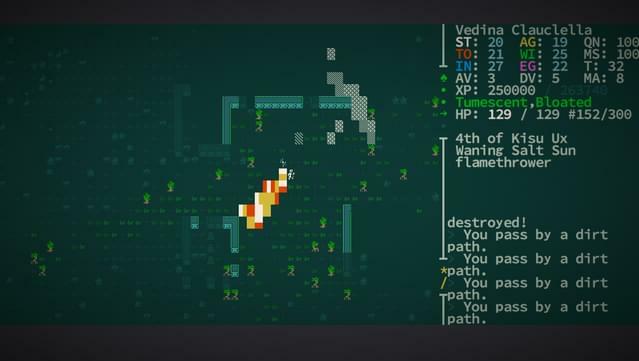 Caves of Qud is a science fantasy roguelike epic steeped in retrofuturism, deep simulation, and swathes of sentient plants. Come inhabit an exotic world and chisel through layers of thousand-year-old civilizations. Decide: is it a dying earth, or is it on the verge of rebirth? NOTICE: a complete development roadmap can be accessed here. 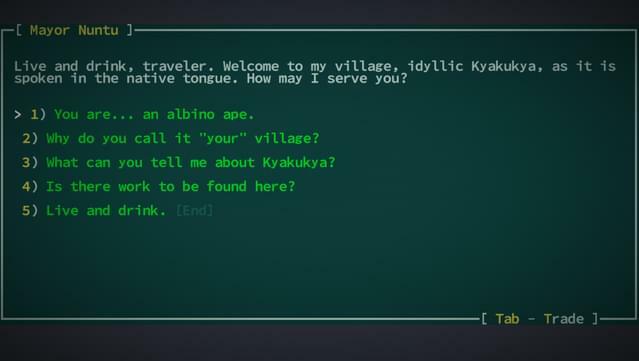 Play the role of a mutant indigenous to the salt-spangled dunes and jungles of Qud, or play a pure-strain descendant from one of the few remaining eco-domes—the toxic arboreta of Ekuemekiyye, the Holy City; the ice-sheathed arcology of Ibul; or the crustal mortars of Yawningmoon. 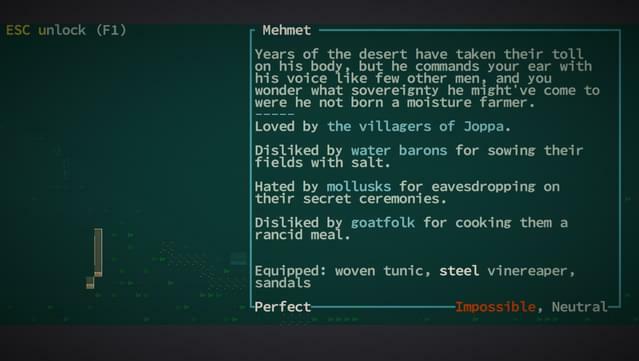 You arrive at the oasis-hamlet of Joppa, along the far rim of Moghra'yi, the Great Salt Desert. 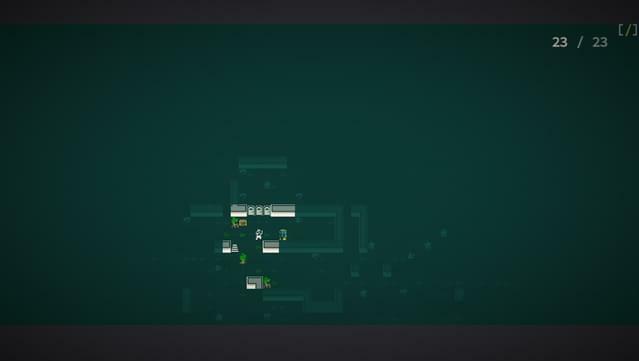 All around you, moisture farmers tend to groves of viridian watervine. There are huts wrought from rock salt and brinestalk. 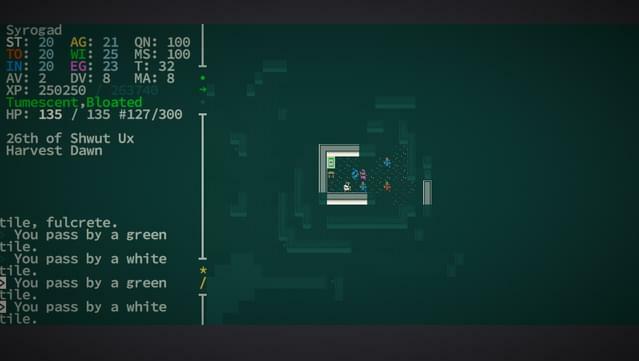 On the horizon, Qud's jungles strangle chrome steeples and rusted archways to the earth. Further and beyond, the fabled Spindle rises above the fray and pierces the cloud-ribboned sky. 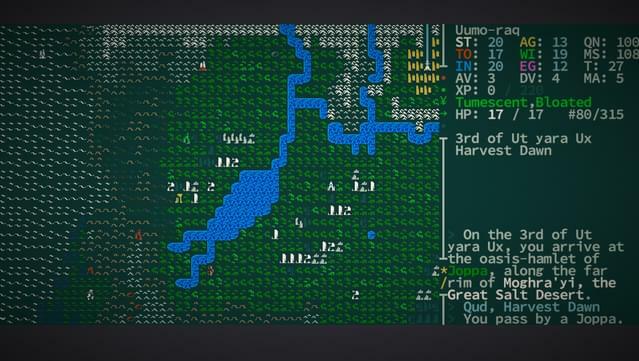 You clutch your rifle, or your vibroblade, or your tattered scroll, or your poisonous stinger, or your hypnotized goat. You approach a watervine farmer—he lifts the brim of his straw hat and says, "Live and drink, friend." Anything and everything. 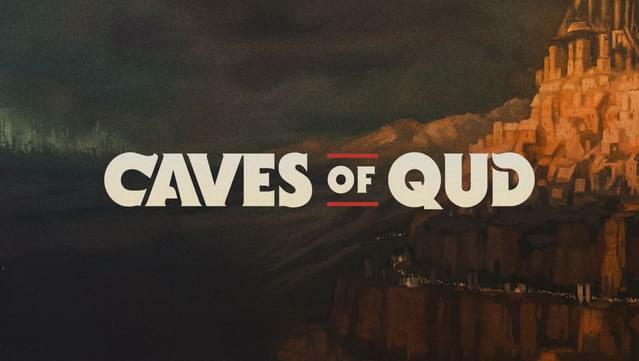 Caves of Qud is a deeply simulated, biologically diverse, richly cultured world. 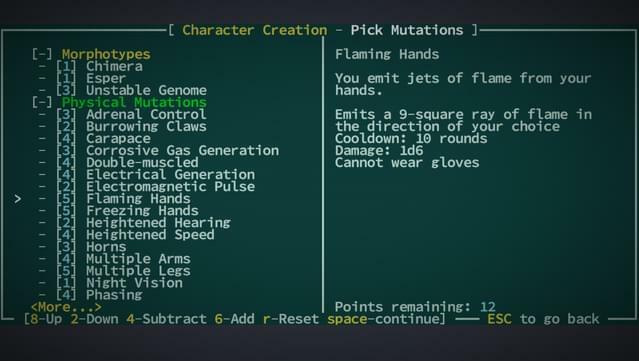 Assemble your character from over 70 mutations and defects and 24 castes and kits—outfit yourself with wings, two heads, quills, four arms, flaming hands, or the power to clone yourself—it's all the character diversity you could want. 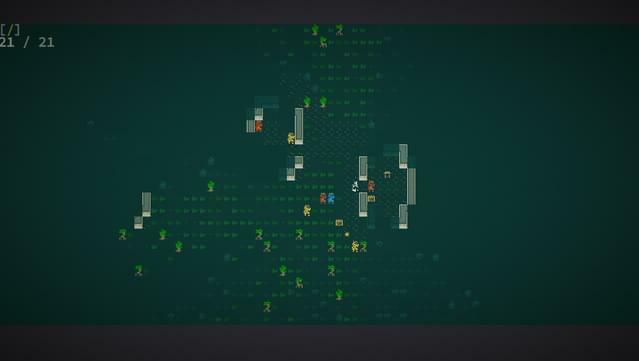 Explore procedurally-generated regions with some familiar locations—each world is nearly 1 million maps large. Dig through everything—don't like the wall blocking your way? Dig through it with a pickaxe, or eat through it with your corrosive gas mutation, or melt it to lava. Yes, every wall has a melting point. 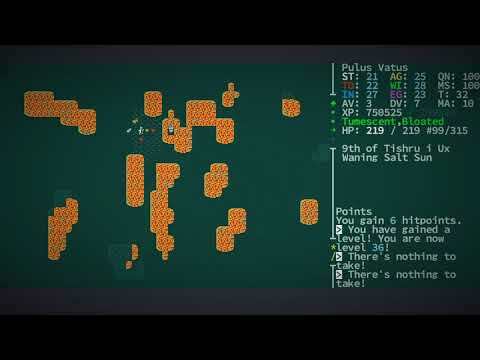 Hack the limbs off monsters—every monster and NPC is as fully simulated as the player. That means they have levels, skills, equipment, faction allegiances, and body parts. 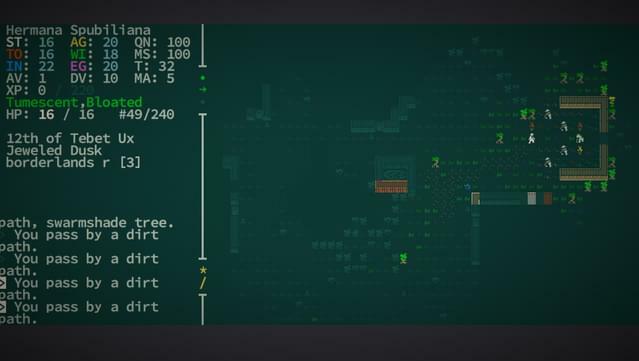 So if you have a mutation that lets you, say, psionically dominate a spider, you can traipse through the world as a spider, laying webs and eating things. 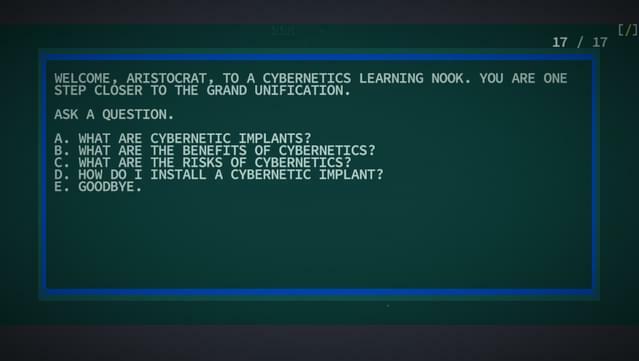 Pursue allegiances with over 60 factions—apes, crabs, robots, and highly entropic beings—just to name a few. 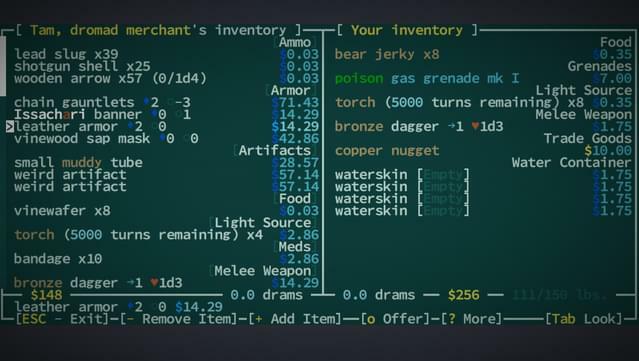 Follow the plot to Barathrum the Old, a sentient cave bear who leads a sect of tinkers intent on restoring technological splendor to Qud. Learn the lore—there's a story in every nook, from legendary items with storied pasts to in-game history books written by plant historians. 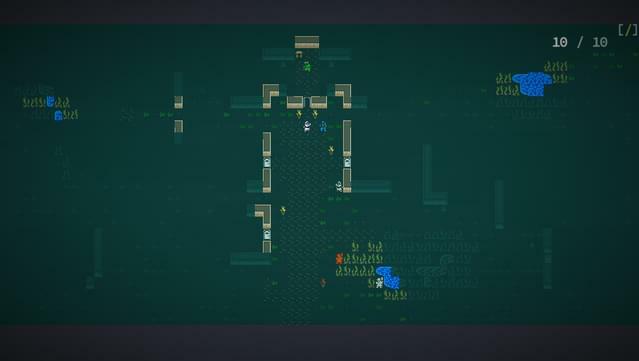 Die—Caves of Qud is brutally difficult and deaths are permanent. 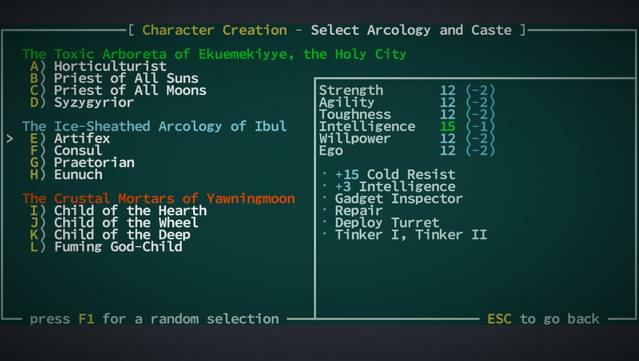 Don't worry, though—you can always roll a new character.